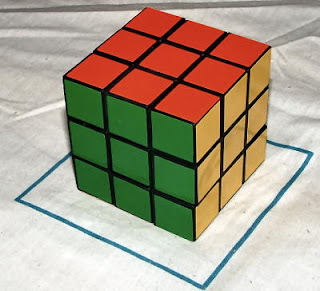 The Rubik's Cube became a pop-culture defacto in the 80's. I remember owning one when I was a kid. I twisted and turned... twisted and turned... and couldn't solve the damn thing. Out of frustration, I resorted to cheating. One time, I disassembled the cube and put them back together with all the solid colors aligned...made it much more like a lego puzzle than a mindboggler. The next time I cheated was when I peeled off the colored stickers from each side and re-attached them to the correct side to form all the colors. In short, I never was able to honestly solve the rubik's cube. Fast forward to 2008 and three years has passed since it's 25th anniversary commemoration of this great invention by Emo Rubik. I've seen a 4x4x4 and 5x5x5 cube. I don't think I would want to get my hands on those more complicated ones till I solve the original 3x3x3 one. And so, I bought a Rubik's cube again in hopes to eventually solve it. I haven't had any luck so far but I'm trying. I don't intend to cheat, but I may search online for tips and techniques on how to solve it. I also intend to bring it whenever I have a hunch I'll be stuck in a traffic gridlock. I wish the cube had an internal counter totalling the number of turns before solving it. I, together with a bunch of roommates, cracked the technique back in my college dorm. If you'll know the pattern, you'll be amazed how easy it really is.